Sir:—I have perused the papers1 communicated to you by the Chargé des Affaires of France. The propositions to which they relate, as far as they are understood, appear to me inadmissible. The only advantage they offer to the United States is a prolongation of the time of reimbursement. The rate of interest is to remain the same, and the place of payment, according to the probable course of exchange, is to be altered for the worse from Paris to Amsterdam. A premium of five per cent. is also required, while the charges on the loans we make in Holland do not exceed four. There is, however, a proposition which is not understood: it is that the exchange on the sum to be paid at Paris and received at Amsterdam shall be regulated according to the tariff announced in the law of Congress. Now there is nothing in the laws of the United States to which I can apply the term tariff. It is possible, however, that Mr. Short’s letters, when received, may throw light on this point and some others, which may give a different complexion to the business. But there are various collateral considerations in relation to the transfer of the debt due from the United States to France, affecting the credit and financial operations of this country, which will make it in almost any form a delicate operation. It is desirable on every account to make expeditious payment to France, but this desire must be conciliated with that of invigorating and perfecting the system of public credit of the United States, and in adhering to this idea there is the additional inducement of a tolerable prospect of satisfying the claims of France in a manner perhaps as expeditious and probably more efficacious than would be incident to an acquiescence in the proposed plan. I have the honor to be, with great respect, etc. Relating to the payment of our debt to France. 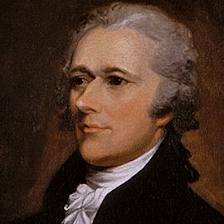 This entry was posted on October 11, 2013 at 12:23 pm and is filed under Cabinet Paper, Foreign Affairs, The Works of Alexander Hamilton, Thomas Jefferson. You can follow any responses to this entry through the RSS 2.0 feed. You can leave a response, or trackback from your own site.